Dr. Bayne is dedicated to serving her patients and her community through practice of state-of-the-art dental care. With almost ten years of experience in the Edmonton area, Dr. Bayne is thrilled to bring her enthusiasm and expertise to the Preston Dental Centre team. Born in rural Manitoba, Dr. Bayne received her degree in biology from the University of Winnipeg (’94). She then attended the University of Alberta (’00) where she received numerous clinical and academic awards and was placed Inaugural Dean’s Honour list of the Faculty of Medicine and Dentistry. Dr. Bayne is an expert in cosmetic, implant and restorative dentistry. She is fascinated by advancements in dentistry and keeps up-to-date with the latest technologies, techniques and equipment. She is a standing member of the Canadian Dental Association and Ontario Dental Association. Locally, she is a member of the Ottawa women’s dental study club. 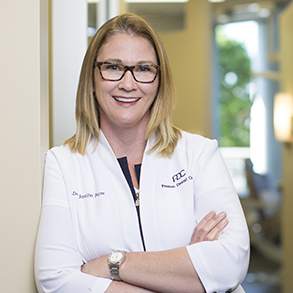 When Dr. Bayne is not practicing her passion for cosmetic dentistry, she enjoys spending time with her husband, Major Peter Bayne, daughters, Cate and Amanda, and dog Charlie. Her philanthropic efforts support scientific research, particularly finding a cure for breast cancer. She loves to travel and once took a trip, literally around the world. An aspiring athlete, Dr. Bayne hopes to complete a triathlon, soon!